Elkagorasa the Casual: October News: Priest hits 100! Holidays, Holidays, and More Holidays! QQ about Valor! October News: Priest hits 100! Holidays, Holidays, and More Holidays! QQ about Valor! Ah Fall is here. We've already had our Brewfest, Harvest fest and now Hallow's Eve! What a busy month. (Why did we have the harvest festival happen in October? US-Turkey day is late November. Blizzard are you planning to mess with my month? A little something post-BlizzCon, hmmm??) Let's see where can I begin? Elkagorasa completed the ring quest chain, including killing Archimonde. He now has 2 (of 5?) statues set up in his garrison. Quest completed, I haven't stepped into a raid instance since. I still want to attempt a normal raid, but don't seem to have a lot of free time at night, so only quick stuff. My priest has hit 100! That was actually quite a non-event. She finished the first few quests in Nagrand, opening her outpost there and DING! Oh, I wasn't even really expecting it. From there, I tried my luck at the proving grounds. ONE SHOT! Couldn't even queue for heroic dungeons until this week, but I could heal proving grounds just fine.. Go figure after the crazy # of tries for warlock DPS silver. Getting back into healing hasn't been as hard as I envisioned (post nightmare patch 6.0 fail-fest). She's able to mostly keep the party alive. I do see that the other hybrids are helping out. I sort of got forced into healing when running Skyfall as shadow, and having the healer drop on the first trash. "Hey, priest can you heal?" Sure, just take it slow, my gear isn't very shiny. She's now working on rounding out her gear. Already equipping 3 pieces of crafted gear, I had a fairly decent start. So, my warlock checked his bags, and found as many baleful gear tokens. Next PVP gear was immediately available, so she picked up shoulders (i670), wrists (i625) and legs (i670). This was through a combination of BG wins and honor purchases. Next came a little flying around in Nagrand to kill some bosses, but that didn't last. But overall, timewalking has been the best source of gear. With my first TW LK run, I picked up the 500 TW token quest. This allowed me to buy 6 updates! Bringing my overall gearscore up almost 50 points. Sundial of the Exiled (675) - currently reserved for shadow. Looking back at my talent spec, it's still designed for SoO atonement healing. Thinking I need to go something more like this (based on Icy-Veins post and some experience so far). I keep forgetting to trigger Power Infusion, so need to see why Vuduh isn't handling it. Macro it maybe? Next came approximately 50 kills on Headless Horseman to get the healer ring. Another 50 with the druid to (try to) get agility ring (which still hasn't won) and warlock, simply for chance to get mount. Next items to focus on replacing ... heirloom cloak, crafted pandaren belt and pandaren lfr off-hand. Now that her gear score is high enough, she is allowed to run LFR. Maybe this weekend she'll see Highmaul. If she ever gets the quest (maybe it's my quest log and hadn't seen it?? ), maybe go open Tanaan Jungle area. Flying around makes rares and treasure hunting painless. Speaking of Hallow's Eve, I was quite happy with the event's coordinator. She's helped my warlock deck out his garrison with pumpkins, the ghost summoning mystic, and supposedly a brew vendor? (who hasn't shown yet). I haven't ran any of the dailies on my non-dps toons yet. They're too busy timewalking and HH fighting. Path 6.2.3 has promise. 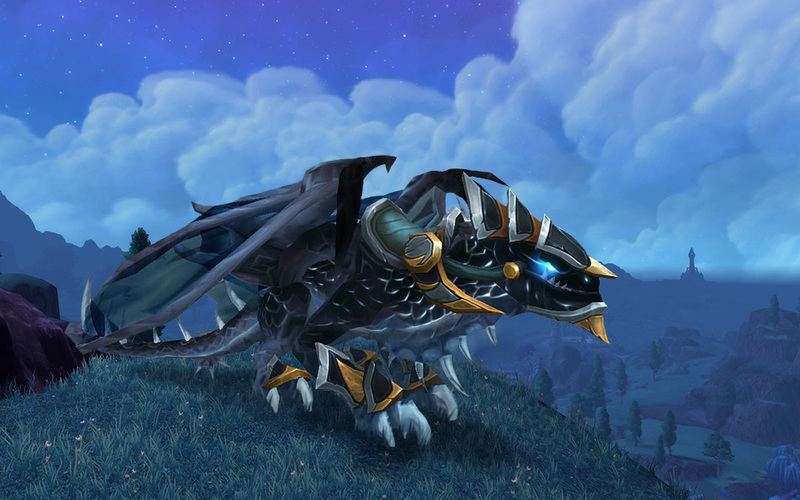 Valor (upgrades), cata timewalking and better Tanaan drops! I do love the new TW mount. Really curious as to what the actual drop rate will be for this guy. My guess is that he'll be terribly rare. My only complaint being that the valor upgrades are going to be 250 valor for 5 ilevel and it getting valor tokens will be slow.